Looking for the best travel money rates when buying your holiday money? Check any additional charges that may apply when buying foreign currency using particular payment methods. Currency suppliers may incur higher costs for processing travel money transactions from credit card companies than debit card suppliers or when bank transfers and cash is used to purchase holiday cash. They may pass these charges on to you. Additionally, a travel money transaction will be classed as a cash advance by your credit card company and they will charge you. Most debit cards do not charge, but those that used to be Delta (now Visa Debit but not all Visa Debit) do - these include Co-op, Lloyds and Smile. Many bureaux de change will accept electronic transfers directly from your bank account including Faster Payments. As you are really interested in the best fee inclusive deal when comparing Travel Money Rates, it's important to take all additional fees into account. Is it better to collect your holiday money or have it delivered to get the best Travel Money Rates? If you collect your travel money in person it is often cheaper, particularly if your foreign currency purchase is modest (many currency companies only charge a delivery fee on smaller currency purchases, typically under £500). Doing it in person gives you the opportunity to pay with cash - avoiding any credit/debit card charges - but don't forget to take your time and travel costs into consideration. Also you may wish to avoid the security issues involved with carrying a lot of cash around. Delivery of holiday money is often free for transactions over a certain level (see table via green button above) but will need a signature on delivery or collection from a Post Office. Some companies can arrange for you to pick up your holiday cash at the airport. What protection is there when buying travel money? 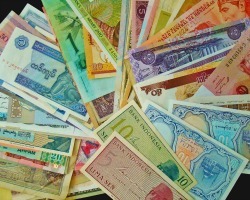 Unlike deposits with banks and building societies, foreign currency purchased with bureaux de change are considered to be selling you goods, so travel money is not protected by the Financial Services Compensation Scheme and, if the company goes out of business, the FSCS will not compensate you. Companies regulated by the FCA do have to abide by certain minimum solvency limits and codes of practice and must provide the customer with information about charges, risks and safeguards and tell you how to complain. If they are are just registered with the FCA (as opposed to regulated) this gives lesser protection and does not mean the foreign currency supplier will have its solvency measured. To minimise your exposure to a company going out of business, keep the delay between paying for your foreign currency and currency being despatched/collected to an absolute minimum.